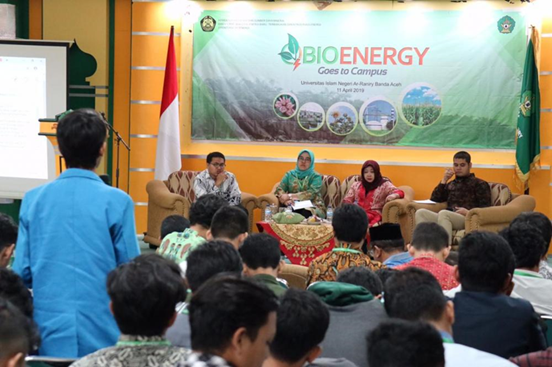 BANDA ACEH - The Bioenergy Goes to Campus (BGTC) activity was held today (11/4) at Ar-Raniry State Islamic University (UIN), Banda Aceh City. This Goes to Campus activity is the first and foremost activity for 2019. In this event, BGTC invites Faculty of Technology and Science students and students to present speakers from the Directorate of Bioenergy Directorate General of EBTKE, UIN Ar-Raniry, Association of Indonesian Bioenergy Electric Producers (APLIBI), Indonesian Biofuel Producers Association (APROBI), and Energy House Foundation (YRE). 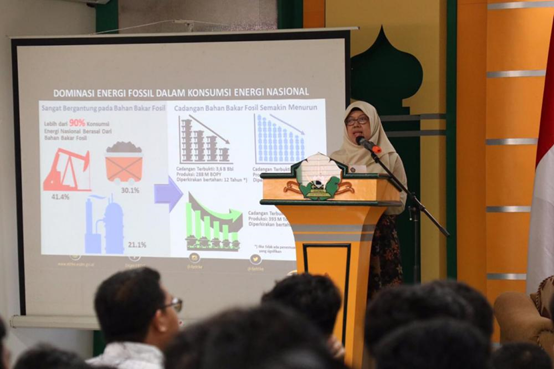 The Director of Bioenergy, Andriah Feby Misna revealed that BGTC is not only socializing the Ministry of Energy and Mineral Resources program, especially in the bioenergy field, but also inviting students and University to take their respective roles in developing bioenergy, to support efforts to develop New Renewable Energy (EBT) for resilience national energy. "We want to disseminate MEMR programs, especially renewable energy, more specifically bioenergy as well as information sharing. Another important goal is to synergize existing policies in the Government with the academic community so that we can work together because frankly we also need to be supported from college friends, so we hope that there will be a synergy from universities with government institutions in particular with us, the Ministry of Energy and Mineral Resources, "explained Feby. Feby further reminded that currently the availability of fossil energy needed in daily activities as an energy source is depleting, while the need for energy continues to increase. Therefore, the existence of renewable energy sources such as bioenergy which can be one solution must be developed and utilized optimally. "If we look around us a lot that we can use, especially the younger siblings here from science and technology, I think this is an opportunity for the younger siblings to explore our natural potential for our common prosperity," she hoped. Regarding bioenergy, the Government has also encouraged Stated Owned Enterprise (BUMN) such as Pertamina and PLN to be able to optimize the use of bioenergy. PT. Pertamina is currently conducting various trials at its refineries so that it can process vegetable oils to be used as fuel oil (BBM) such as diesel, gasoline and aviation fuel. So, it is expected that even though crude oil production will decline, production from refinery will remain by mixing crude oil into the refinery unit with vegetable oils such as palm oil. PT.Pertamina will also build a new refinery unit in collaboration with ENI-Italy to process CPO into green diesel. Current processing technology is still expensive, but if this effort is successful, Indonesia can be independent for liquid fuels, because it is an agricultural country, the potential of oil palm and other biofuel sources is also quite large. PLN which is currently using PLTD is also encouraged to be able to replace its solvent fuel with CPO. PLN is also required to buy energy produced from renewable energy. "This effort is done to anticipate our fossil energy resources that continue to fall so that we can still realize energy resilience and independence. 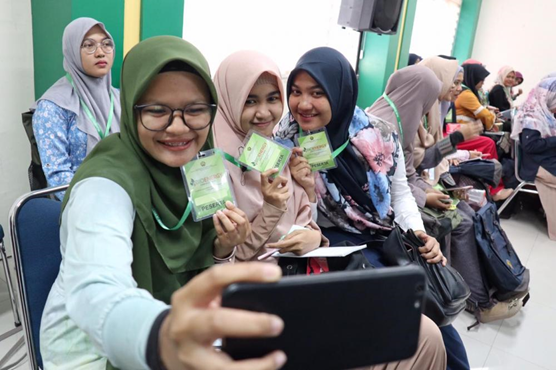 As the next generation, we expect students to be able to implement tri-dharma tertiary institutions well to realize sustainable development," concluded Feby .